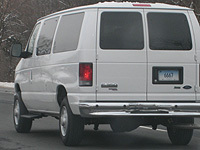 These plates are issued to carpool commuter vans transporting passengers to work, such as the "Easy Street" vans seen around the state. This type started in 1980. The officially-issued plates have always been blue on white, changing to the generic "blue fade" base in 2000. Shortly after this type was introduced, Van Pool became Vanpool.